The teaser trailer hints at co-op play, and thanks to some crafty press release translating by NeoGAF member duckroll, it's confirmed that Freedom Wars will support eight player co-op and competitive modes, Adhoc and Wi-Fi Online. New batches of screenshots and pieces of artwork are scheduled to be unveiled in weekly increments every Thursday, so hopefully more information will come soon. Until then, feel free to call it Monster Hunter for PS Vita like everyone else seems to be doing. 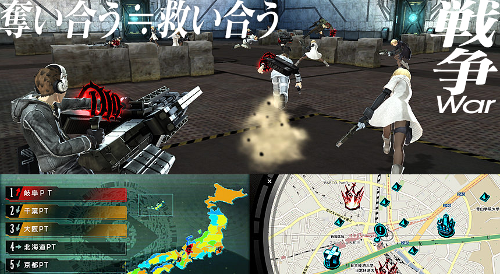 Freedom Wars is scheduled for release on PS Vita in Japan in 2014. SCE Europe has trademarked the name "Panopticon", which suggests an international release that could possibly revert back to what we thought the game was called in the first place. That isn't confirmed, though, so no fair running to us when an English localized version is officially denied. In the meantime, you should totally read up on what a panopticon actually is. A little philosophy lesson never hurt anyone (except Socrates). Page created in 0.7895 seconds.